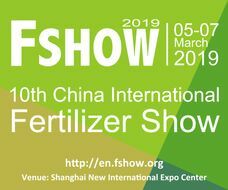 FSHOW2019, 10th China International Fertilizer Show will be held on 5-7 March, 2019 in Shanghai New International Expo Centre. FSHOW is the fertilizer zone of China International Agrochemical & Crop Protection Exhibition (CAC), CAC is world largest agrochemical exhibition and a UFI approved event in 2012 with more than 1,300 exhibitors and 78,000 sqm exhibiting space. China International Fertilizer Show (FSHOW) is an annual event now in its 10th year, and it has become one of leading and famous shows in the fertilizer industry. The annual FSHOW provides fertilizer enterprises a wonderful platform to display the enterprise situation, explore the market, find cooperation partners. Meanwhile, FSHOW also provides purchasers home and abroad a reliable purchasing platform. FSHOW2019, exhibiting space is expected to be 25,000 sqm with more than 400 fertilizer exhibitors from all over the world. You will meet more kinds of products, more people from the whole world and more information in fertilizer field. We cordially welcome you to join in this wonderful moment! FSHOW2019, many famous and large-scale enterprises have booked stands, such as LUXIGROUP, KINGENTA, SEAWIN, WUZHOUFENG, STANLEY, ZHONGDE GROUP, XINYANGFENG, MONBAND, JIAOCHENG HONGXING, RIZHENGJIUAN, BRIGHT MOON BLUE OCEAN, FONDIN, JINGLING OCEAN, BELUCKEY, GENLIDUO, CITYMAX, HAITOR, MIGAO, SQM, STOLLER, RURAL, HUMA, ETI MADEN, LIMA, AGRITECNO, HEFE FERTILIZER, RNZ, OMNIA, FERM O FEED, RALLY, H SULPHUR CORP., ALTICHEM etc. Exhibition Combines with Professional Conferences-------We will hold several professional high-end conferences and new products release conference. Water Soluble Fertilizer, Slow/Controlled Release Fertilizer, Plant Biostimulant, Seaweed Fertilizer, Humic Acid Fertilizer, Amino Acid Fertilizer, Microbial Fertilizer, Micronutrient Fertilizer, Fertilizer Additive, Soil Conditioner, Organic Natural Fertilizer, Environmental Friendly, Special Fertilizer, Chelate Fertilizer, Water Flush Fertilizer, Foliar Fertilizer, EDTA, Compound Fertilizer, Polypeptide Fertilizer, Phosphate, Sulfate, Nitrate, Nitrogen Fertilizer, Potash Fertilizer, Magnesium Fertilizer, Fertilizer Packaging and Production Equipment, Integration of Water And Fertilizer, Irrigation, Fertigation Equipment, Soil Analytical Instrument.